Last time, I talked about my personal experience with sugar fasting. Today, in relation to our sugar fast, I want to talk some about the science I've seen involving the relationship between sugar intake and overall health. One of the biggest issues I have with junk foods is not what's in them, it's what's not in them. When we fill up on nutrient void junk food, we are replacing foods that would be nourishing our bodies with foods that can actually be damaging them. It's confusing to our systems because, in nature, most sweet foods are full of nutrition, and most calorie dense foods are very filling. Not so with processed, sugary treats. Our bodies want more and more because they're thinking "What am I supposed to do with this? Where is my nutrition? I don't feel satisfied for long with this." Where's the sense in putting your body through that day in and day out? 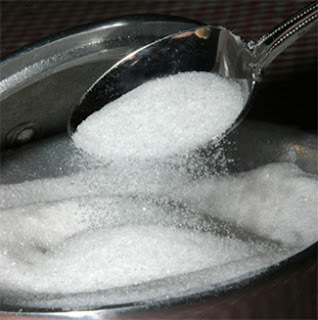 It's a well known fact that ongoing, excessive sugar (and refined carbohydrate) intake can trigger adult onset diabetes. I also struggled with frequent (at least once daily) bouts of hypoglycemia when I was pregnant with Izzy and was eating a lot of sugar. If my blood sugar started to drop, I'd eat something sweet. I didn't know that I was making the problem worse and adding momentum to my blood sugar roller coaster. This pregnancy, the only problems I've had with hypoglycemia came around Christmas when I was overdoing it on the desserts at all the parties we went to. When your body is constantly receiving an onslaught of sugar, and responding with a big release of insulin, it's not long before the system gets off balance and you end up with either an overactive pancreas (reactive hypoglycemia) or one that gives up altogether (diabetes). The constant battle to keep up with overconsumption of sugar also wears our your adrenals, triggering or worsening any syndrome associated with the adrenal system such as chronic fatigue, fibromyalgia, and the like. This, combined with the emotional roller coaster of high and low blood sugar can also aggravate emotional disorders and ADHD. This misplaced calcium either makes it's way out of the body through urine or is stored in unhealthy ways, such as in gallstones or kidney stones. Sugar also suppresses the immune system for a number of hours after consumption, so if you (or your child) is getting sugar multiple times a day, you may be dealing with a constantly suppressed immune system and more viruses and infections. Sugar promotes inflammation, which is probably why I have a fibromyalgia flare-up whenever I consume too much of it. This would also affect people dealing with athritis or any other chronic pain. Sugar feeds bacteria in your tummy, bad bacteria. If you struggle with any type of ongoing "tummy issue" such as IBS, Crohn's, or Heartburn and Indigestion, you can bet that sugar consumption will aggravate it. Considering the fact that the standard american diet is completely devoid of foods containing beneficial bacteria, and we're constantly sanitizing away any that we might accidentally come in contact with, it seems very counterintuitive to be feeding the bad guys in our gut their favorite food every day. Ok, if I haven't convinced you yet, here's a good inspiration for all of you ladies to give up the sweets - it makes you grow older, sooner. Sugar suppresses the release of Human Growth Hormone, which slows the aging process. It also promotes glycation, which speeds up the aging process and causes irreversible damage. Ok, should I give up all sugars forever? What about fruit and milk? Don't they have sugar in them? The resources I found all agree - it's the overconsumption of sugar that causes problems for most people. Also, sugars naturally occurring in food don't have the same effect because 1) They are still in their natural form and 2) They accompany nutrients like fiber, minerals, and fats that help the body process them more effectively. It depends on who you ask. The World Health Organization says no more than 10% of your total calories. For most people, that's around 50 grams a day. This is about the equivalent of what you'd find in a 20 oz soda. That seems like a lot to me, but everyone's body is different. According to author and doctor Nancy Appleton, the average person can handle no more than 2 teaspoons of added sugar a day, no more than 2-3 times a day, and no more than 2 Tablespoons total in a day. This seems like a more reasonable amount for me personally, but it's kind of confusing. To help make it a little clearer, one teaspoon of sugar = about 4.2 grams. Something like 16-20 grams a day total. So, that breakfast cereal with 14 grams of sugar per 3/4 cup is probably not gonna make your list of health foods. Or that "healthy" granola bar with 11 grams of sugar per tiny bar. So, there you have it, a list (though I'm sure not exhaustive) of health issues caused or aggravated by the overconsumption of sugar. Watch your labels, read your ingredients, and give your body a chance to tell you how it can feel without being bogged down with sugar! http://www.westonaprice.org/childrens-health/zapping-sugar-cravings - This is the Weston A Price foundation. I also referred to my Nourishing Traditions cookbook p23-25. Do you or your family suffer from any of these afflictions? Have you tried limiting or giving up sugar as a way to manage them? It also feeds candida, as I have recently learned :( I am having to give up added sugar (even fruits) for now. I am hoping to be able to heal my gut so I can enjoy sweet treats once in awhile in the future. Informative post! Hi Sarah! I 've chosen your blog to receive the Liebster award! Thanks so much for all the good reads! My post with all the awarded blogs can be found here. That's right, Heather, I remember hearing that because my mom has ongoing candida issues, as well. Thanks you so much for the honor, Kathy! I'll be passing on the favor as soon as I have a chance to write another post! I have ALWAYS had multiple sweet teeth. I LOVE chocolate, and cake, and ice cream, and just about anything sweet! I passed that trait on to my children. My son has ADHD and is also dyslexic. We struggle with him on a constant basis about sugar. I tried to cut out all extra sugar from our diet, but my husband undermines me by buying it and bringing it home. We both struggle with out weight, but I've started working out and am hoping to influence him to do the same. I guess we will see!! So glad you enjoyed my post, Jacque! Best of luck on your health journey! It's a lifelong process, and I know that your husband will be inspired as he sees you making positive changes! When I first got married, my husband and I would alternate weeks on the "health" food. It was a compromise, but it made him way more open to trying new things and make changes. Now he's as big a health nut as I am! Wow...you are really convincing me. OK, it was the aging thing...I'm in my 40s :/ So, that is on my mind a lot these days. I really need to watch it on the sugar. These are really good posts; you are really doing a service with them. Thanks for the encouragemnt, Libby! I have found so much health and joy in changing our eating habits, I can't help but share! I really didn't think I consumed much sugar. However, I was having headaches and toothaches that couldn't be explained. My chiropractor suggested I give up sugar totally for a while and see what happens. After just a week, no headaches and toothaches! I went over a month until I had a piece of cheesecake at a friend's house - headaches and toothaches returned! Guess the sugar really does have an adverse affect on our bodies! Marci, isn't it worth it to feel so much better! I love sugar, but I love feeling great even more! Jessi - I'll head over there now! Great post! Sorry I took so long to get over here. You're right about the sugar and heartburn. I have acid reflux and if I don't watch my diet a few cookies or cake or ice cream can just send me over the edge and I start having symptoms. Sad, because I love sugar, lol! Good for you about your daughter. We never allowed our children to have candy until they were three (that was supposed to be the rule anyway, and we did pretty well with it), and we tried to limit their sweets, etc., as they were growing up. As you said, why would I want to encourage the candy when a piece of fruit will do? I, however, love sugar, lol! But I have to be careful now. Thanks soooo much for linking up to Making Your Home Sing Monday! Glad you enjoyed my post! We made it through Easter and big festival event at our town sugar free! I don't think my Izzy missed it at all. I have to confess, it wasn't easy for me, but so worth it, especially considering all my body is going through with the pregnancy right now!